I would like to start today’s review with my surprise that the HYIP I reviewed this Tuesday already stopped paying. This is something that doesn’t happen quite often. Unfortunately, this is something that always must be kept in mind. 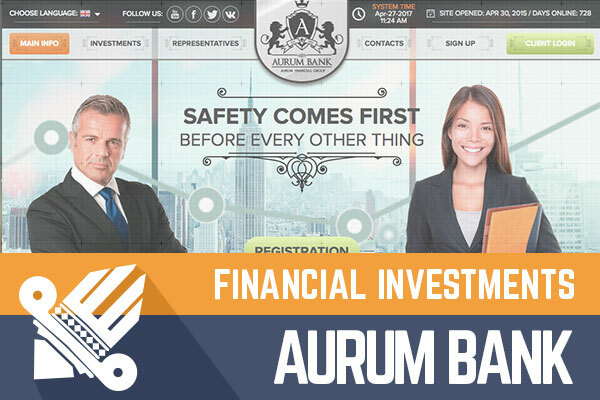 However, today we will look at the next rival in the HYIP industry – a program called Aurum Bank. Aurum Bank joined Golden Stage listing 5 days ago and is being monitored since. However, the program admin claims on the website that it has been online already for 728 days. Now, I have reinvested into this program $400 and will be keeping an eye on the performance of this HYIP, to inform you about its status. Right from the first interaction, the program gives a very strong impression of a connection to financial services. Businessman and businesswoman on the homepage are looking at you. I’m not a big fan of websites where you have people staring at you because it makes me feel a little bit uncomfortable. However, everything except these pictures of people on the slider image looks fine. The most important information about their plans can be found on the first page right after the slider and company biography. Moreover, a pop-up calculator can be found easily on the sidebar of any page. Simple, yet functional layout and design. This website is built on Gold Coders script. Aurum Bank is using heavy approach of reviews and testimonials. They can be found both on the website and social media profiles. There are 6 testimonials in total and in all of them you see smiling people sharing their successful experience about this program. Most likely video authors have received some benefits from it. On the page called Promo Bonus of the Aurum Bank website, you can find information about promo review guidelines and $5, which can be earned by creating a short video. These reviews are used in the communication on Facebook, Twitter, and Vkontakte. Even though there is only one language available – English, I assume admin is targeting Russian-speaking audience since the HYIP has a profile there as well. Then again, social media profiles look a little bit unrealistic with several video reviews and approx. 2000 likes on Facebook, 2300 followers on Twitter. In fact, the first post is dated 18th of April this year, which makes me think that Aurum Bank is a sleeping beauty. The Web Archive proves it and the last saved version dated 15th of April 2017 is totally different design. Company names haven't changed, but most likely the program has been in sleep mode for some time, to increase its age and now admins have decided to move on and attract some investors. The program has a real company registration information, which proves that the admin has done the homework some while ago. It has been incorporated on 16th of August 2016. I did do a quick check in some forums and found out that the first discussions about this HYIP started in May 2015. There have been periods of silence and more active communication started by the end of 2016. Unfortunately, we have no previous experience with this program, to draw any conclusions and if there were any investors participating in it since the beginning of the program. If there is anyone among you, please share your thoughts about this HYIP in the chat box. I believe there is some logic behind all these things, but it might be logical only for admins, not me and you. It' s time to look at Aurum Bank investment plans and there are plenty of things to see. The admin has chosen quantity approach by offering 25 different investment plans. This must be the record among the reviews I have written here in the past few weeks. It takes time to analyze all of them, to find the most beneficial one. After checking all the plan packages, I assume that the most realistic investment plans are all Classic plans with 0.8% up to 2.75% daily for 40 days and up to 260 days, because investment plans in other groups have very high minimum investment. In fact, even in Classic plans, there is only one plan with min $10 investment, but the next Classic plan has the minimum investment of $350. As usually, you must do your own calculations like in most of the cases, to understand a daily profit. For example, Classic 0.8% daily for 260 days looks like an affordable plan to me due to its min deposit. In this case, $200 would reach its break-even point only after 125 days. After 260 days, it would reach a profit of $400 + initial deposit is returned at the end. To be honest, these investment plans look very unrealistic to me. Especially, when there are many other programs offering 3-5% a day. 260 days is a very long time for a HYIP due to the nature of this industry. My intention of the calculations is to explain you the plans, which often are explained in a difficult manner. To sum up, everything I have written so far, Aurum Bank is a HYIP with very high min investment amounts. Moreover, for a realistic amount of deposits like I mentioned above it takes plenty of time even to reach the break-even point and not to mention real profit. In terms of website and marketing approach, I must admit that the website is not the best example of the web design. Yes, I don’t like people (images) staring at me on the web. However, it was logical, functional, and well structured. Aurum Bank review approach seemed an interesting way of getting content for the communication, but the number of followers looked totally fake. There must be a shortcut, which they have used, to get such results. I believe this project has been a sleeping beauty and soon we will see its development. Investment plans: 0.8% up to 2.75% daily for 40 up to 260 business days, initial deposit returned at the end of the investment term. Ignore other investment plans.